You just can't find uninfested aircraft carriers these days. When we last left our heroes, Bill Paxton and his ragtag crew of hardasses (and Bruce Campbell) were as close as ever to escaping their aircraft carrier-shaped prison. 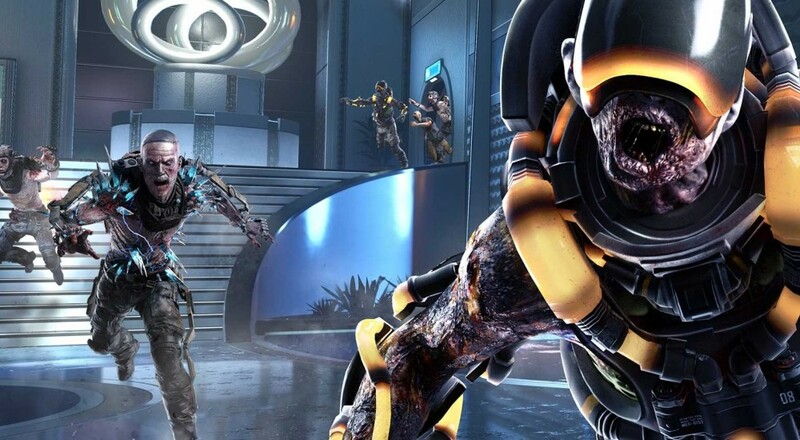 "Reckoning", the fourth and final DLC pack for Call of Duty: Advanced Warfare, aims to finally bring the Exo Zombies cast to something that isn't effectively undead flotsam. But wait, like the plethora of zombie fiction both pre-and-proceeding Exo Zombies, there's a twist! At some point during the escape, the gang finds their old pal, John Malkovich, except this time he's all "What's up, idiots, I'm a zombie now." And Bill and friends are like "Woah", and the player is all like "Woah", and somewhere off the coast of Mali, Eric Hirshberg is slapping a cocktail waiter with the frozen hundred dollar bill that was garnishing his drink. I jest out of (mostly) love, of course. The Exo Zombies storyline, though it may not be groundbreaking, is quite the feat for a four player co-op mode that isn't even Advanced Warfare's main campaign. It's great to see co-op gameplay being given this kind of treatment, and it makes me hopeful for the future. Also, I'm more than happy to see Bruce Campbell in whatever role he happens to find himself in, chainsaw amputee or otherwise. "Reckoning" touches down on Xbox Live on August 4th. At this point, you probably know the general details of these DLC releases, but the pack also includes an extra four maps for the game's competitive multiplayer scene. If that's your thing, I hear New Baghdad is nice this time of year. Page created in 0.5196 seconds.